Diving has been a pastime throughout the world since ancient times, but it only became a competitive sport when the first diving competition was held in England in the 1880’s. “Plunging” became popular during the 1800’s, with divers plunging head first into the water from various heights and then whomever could glide the farthest underwater would be declared the winner. As far back as the late 1800’s, during the summer months training gymnasts in Germany and Sweden would move their sessions to the beach, performing somersaults and twists over the water as part of their training. This was referred to as “fancy diving”. The act of diving into water before swimming was referred to as plain diving. Plain diving first became an Olympic sport in 1904 and today is one of the most popular Olympic events with spectators. The first Olympic diving competition consisted of two events: men’s platform diving and plunging, and only Germany and U.S.A. were the only countries competing. George Sheldon of the U.S.A. won but only after a great deal of controversy. The Germans chose to execute more difficult dives, while the Americans concentrated on simpler dives but executed them more precisely. The Germans believed that the difficulty of the dive was the most important factor, even though this often had them landing on their stomachs when they reached the water. The Americans on the other hand believed that performance took precedence over difficulty. Although protests took place Sheldon won out the day. The decision to favor performance over difficulty set a precedent. While the addition of diving to the Olympics was important to the sport, diving competitions had been held for several years prior to 1904. In 1905 the National Graceful Diving Competition, the world’s first championship diving event, was held in London, England. High diving had became a competitive sport, with athletes running from either 15 or 30 feet and then diving, or diving from a standstill from a raised rigid platform. In 1908 fancy diving got added to the Olympic diving events, along with springboards, but it wasn’t until the 1912 Olympics that women divers were given the right to compete, and even then they were restricted to plain diving and no somersaulting or twists were allowed. At the 1920 Olympics the women’s springboard event got added but women competitors were still restricted to plain diving only. The 1928 Olympics saw plain and fancy diving combined into one event and given the term highboard diving, and women were finally allowed to perform what had previously been referred to as fancy dives. Over the following 75 years Olympic diving events remained essentially the same until 2000 when synchronized diving was added. While the events remained the same the complexities and scoring underwent many changes before reaching the levels they are at today. From 1920 to the early 1990’s the U.S.A. divers dominated Olympic diving competitions but from the 1980’s onwards the women were challenged and beaten by the Chinese, and still are to this day. China is now the leading nation in championship diving in both the women’s and men’s divisions, and in 2008 China’s Olympic dive team won 7 out of 8 gold medals, the women winning all of their events. Diving and swimming competition grew increasingly popular at the collegiate level also during the mid 1900’s. 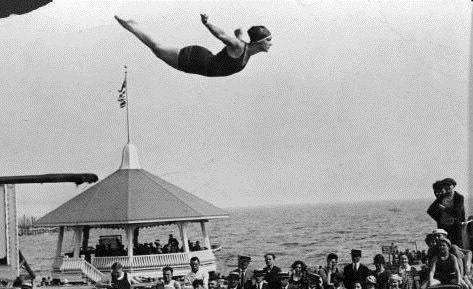 Diving boards have undergone some changes from the early days of plain diving. While initially dive platforms were rigid it was not long before the need for an elastic board became obvious, and so the springboard was born. Despite the name the first springboards had very little spring at all, but today’s diving boards are made from fiberglass and have plenty of flex. Divers today have the ability to control the amount of spring they require to obtain the height and agility they require to perfectly execute their dives. Today there are over 85 platform dives, 60 springboard dives, and four dive positions (straight, pike, tuck and free included in the official FINA with more being added, making diving one of the most exciting Olympic sports both as a competitor and as a spectator.